Plug into simplicity. 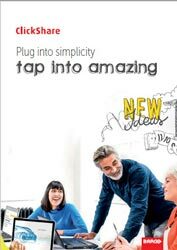 tap into amazing. Thank you for your interest in Barco solutions. CS-100 is ideal for huddle room & small meeting spaces. 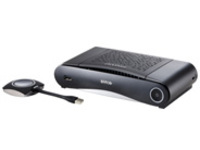 This standalone model delivers full HD to meeting room displays and includes one button for instant sharing. 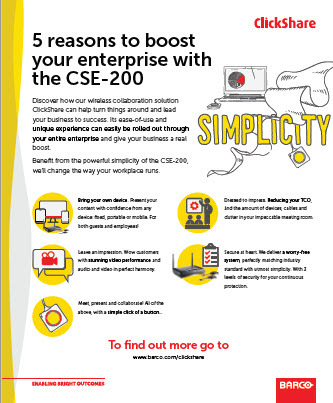 CSE-200 is suited for enterprise deployments. This model is the choice for rollouts which require enhanced security features or central management. 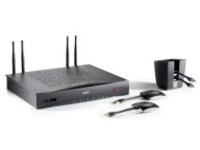 CSE-800 is a perfect fit for your conference and boardroom meetings and offers enhanced features like moderation, blackboarding and annotation. 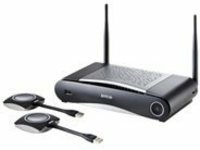 The latest generation of ClickShare collaboration systems contains significant security improvements, while the CSE-range offers best in class security, configured around three levels of security. Reviews components and security features. 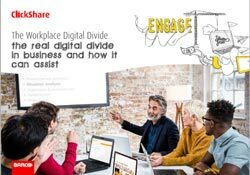 The real digital divide in business and how IT can assist. 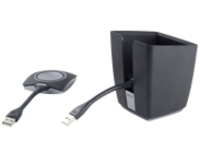 Find the right ClickShare for your meeting room. Contact us to discuss Barco solutions for your organization.